GoodReads Summary: Can you trust your eyes? The newest discovery in the ‘Ology series amazes and thrills as the closely guarded secrets of the illusionologists are revealed! — A pair of "disappearing spot" paddles— A "levitating" card! What Kellee Thinks: I wish this book had existed when I was a child. I was so enthralled with David Copperfield and anything magic and Illusionology puts magic right into the reader's hands. From endsheet to endsheet there are things to discover. Illusionology is written almost as a journal of an illusionist in 1915 thus shares the history of the magic at that point. The book broken up into sections starting with The History of Illusion, The Science of Seeing, Secrets of Card Magic and The Power of Misdirection then ending with The Art of Body Manipulation, The Secrets of Harry Houdini, Exposing the Spirit Mediums, and The Science of Mind Reading. These sections are a mix of instructional manuals, interactive activities, informational text, history, science and art. What Jen Thinks: Magic has always been amazing to me. I'm so horrible at figuring out how magicians do what they do. My brain just tells me that they really do it...that it's not all science and illusion. Maybe a part of me wishes they could really do all the tricks that they do...I mean, I'm totally someone who secretly wishes and believes the world of Harry Potter and Hogwarts might really exist. (I mean, how insanely awesome would that be???) (I remember when I was reading the books, I would walk around thinking I could do do spells...call me crazy.) 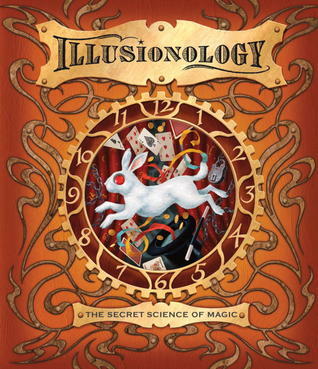 Reading this book was so interesting because it does explain how illusionists have developed their own kind of science. It's really cool to read how they use how our braisn and our senses work or the limits of our brains and our sense to make illusions work. It was completely fascinating. I love how they put this book together. Like Kellee said, it's written like someone's journal but at the same time it's broken up into sections. It's fun how there are little stories or side notes depending on the topic. My favorite part are the flaps that you can open up to read more about a trick. There are pieces in little pockets and cards to play with. It's just such an interactive book. There's a banana magic trick that I can't wait to try on my husband. A very cool expository text. "Many illusionists create stories around their tricks - and card tricks are no different. A certain card can be said to be shy or invisible: an ace is proud of pushy; a king and queen always like to stay together. In effect, a magician is like an actor, wearving a tale to capture an audience's imagination. When you perform magic, remember that you need to perfect not only your technical ability but also your ability to keep an audience engaged. Knowing how a trick is done is only half the battle: being able to convey the magic is where the skill lies." Writing Prompts: Try one of the tricks/illusions from the book, then write about the experience. Was it as easy as it seems to perform or harder? What tips would you give to someone trying the trick?